Antofagasta plc is clearly rattled by the protests and legal challenges around its Los Pelambres copper mine in Chile, because company Chairman Jean-Paul Luksic singled them out for lengthy comment in his opening speech at Wednesday’s AGM. That’s because, between them, they had achieved something that companies fear: they had affected the share dividend. They dominated the short AGM as well – and the only other matter to receive much attention was the company’s efforts to bring itself into line with UK laws on corporate governance. Luksic explained that the recent protests had been over the scarcity of water in the Choapa valley and the legal challenges concerned the flow of the Pupio stream in the neighbouring valley. He said that there had been below average rainfall in the area for some years, especially this year. A small group of protesters had blocked a road in the Choapa valley for ten days in March. Protests had been triggered by a small group of people seeking action from the company and local government over water availability. An agreement had been made, under which the company would help to fund, among other things, a study into the construction of a drinking water reservoir, and would use sea water in any further mining operations. The legal challenge over the flow of the Pupio had led to a court decision ordering the company to destroy all or part of the wall of the Mauro dam, in order to restore the flow of the stream. The company had appealed against this decision, and the tailings dam could still be used while the case continues. Luksic said that it is likely that the company will continue to experience legal challenges. It will continue to ‘engage with the local community’ and to use all the legal means at its disposal to overturn any adverse court decisions. Meanwhile, the company will press on with a feasibility study into the expansion of mining at Los Pelambres. A baseline environmental study is being conducted, and this should be submitted in mid-2016. It has been delayed by the need for additional work following the company’s commitment to use only sea water in the expanded operations. Luksic reported that, at last, the company has divided the roles of Chairman and Chief Executive Officer. (He had previously been Executive Chairman, combining both roles in violation of accepted UK corporate standards.) Jean-Paul Luksic is now non-executive Chairman while Diego Hernandez is CEO. Odd, then, that at the AGM Diego Hernandez said practically nothing. Luksic also reported that, in line with reformed UK corporate law regarding publicly listed companies controlled by a single entity (in this case, Chile’s Luksic family) votes for directors have to be approved not only by a majority of all shareholders but but a majority of independent shareholders. You can read the Chairman’s speech at http://www.antofagasta.co.uk/~/media/Files/A/Antofagasta/pdf/chairmans-comments-at-agm-2015.pdf. When Chairman Luksic called for questions, I was called first. I asked about the company’s compliance with Chilean law at Los Pelambres. On 3 November 2006, the Appeal Court of Santiago had decided that the Mauro tailings dam should never have been authorised, and revoked its permission for construction. On 4 July 2013, the Chilean Supreme Court declared that the Mauro tailings dam endangers the lives of the inhabitants of Caimanes and Los Vilos – mainly because the dam was constructed to withstand earthquakes measuring 7.5 on the Richter scale when it needs to be able to resist earthquakes measuring 9.2. The court ordered implementation of an emergency plan. Had such a plan been produced? I noted that the Chairman had already referred to the Chilean Supreme Court decision of 21 October 2014, ordering Los Pelambres to restore water to the people of Caimanes, and the subsequent decision in March this year by the Los Vilos Civil Court that the plan the company had drawn up in response to the Supreme Court decision was inadequate. Given the fact that the Annual Report stressed the company’s determination to keep all applicable laws, why was it intent on appealing court decisions rather than obeying them? I said that, as I understood it, the Los Pelambres expansion plans involve construction of new dams, also close to human settlements and also only able to withstand earthquakes of 7.5, rather than 9.2, on the Richter scale. How could this be justified, given concerns about the existing dam? Finally, I said that at some stage, sooner or later, the Mauro tailings facility would have to be closed and made safe. Is there a closure plan? Is it in the public domain? I said that my contacts in the community of Caimanes were not aware of any such plan. Would the plan, if it exists, guarantee that, after the mine has been closed, there is no possibility of dam collapse or release of toxic chemicals? Chairman Luksic replied that, on the last point, they had already closed one dam and had not experienced any problems with it in the seven or so years since closure. He assured me that there was a closure plan for the Mauro dam, and later said that it was in the public domain. Francisco Veloso, President of Minera Los Pelambres, said that the company has drafted emergency plans and submitted them to the local municipality for approval. Once approved, they will be publicly available. Veloso said that the reason the company is appealing the decision of the Los Vilos civil court is that it was made without expert input. The appeal allows time for expert opinions to be sought. The company will comply with whatever legal decisions are finally made. 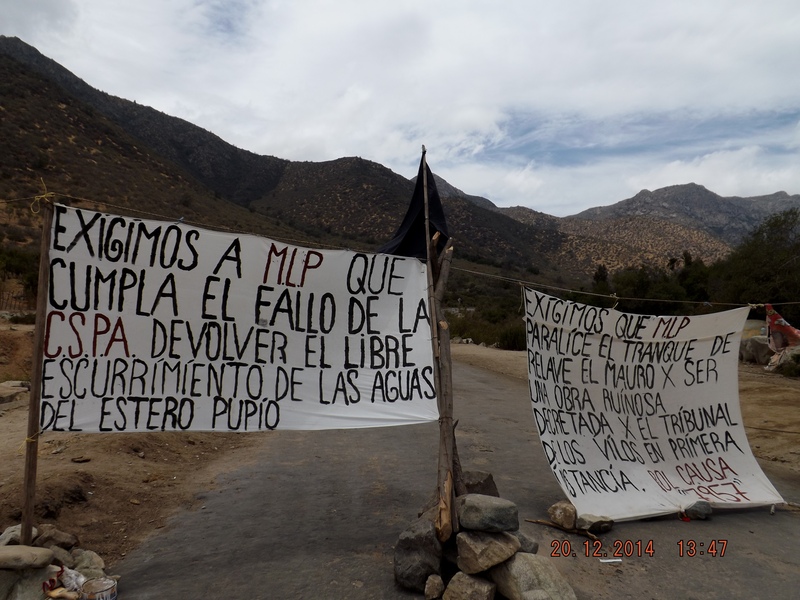 He also said that the Los Vilos court ordered the company to ensure that water is available, but did not mandate the demolition of the dam. A representative of Share Action asked about the company’s climate impacts, asking for the company to commit itself to targets. The Chairman replied that the company – which is making concerted efforts to source energy from renewable sources and has made great progress in this at Los Pelambres – is aware that its copper will increasingly be evaluated on the carbon intensity of its production. The company will continue to make efforts to reduce its carbon intensity, but he was not willing to commit to particular targets or target dates. A representative of the UK Shareholders’ Association was troubled by the company’s commitment to use sea water in its operations. Sea water is hugely corrosive and the cost of bringing it to the mine site would be enormous. She added – presumably as a response to what I had said about the Mauro dam’s earthquake resilience – that she had been in Katmandu in Nepal during the recent earthquake and had been staying in a hotel that was supposedly guaranteed to withstand earthquakes of 10 on the Richter scale. Despite this, there had been buckling and cracking of the masonry – and cracking of a structure with water behind it, she said would be bad news indeed. She urged the company to review the resilience of the Mauro dam. Chairman Luksic replied that the company is a pioneer in sea water use in mining in Chile. Sea water would be pumped 140 kilometres from the sea, up to a height of 2,300 metres. Energy costs would be high, but the issue is the lack of water from the mountains. Facilities have been designed to resist corrosion. Only a little of the sea water – used for human consumption – would be desalinated (a process which also uses a lot of energy). As for the stability of the dam, Luksic said that Chile is one of the most earthquake-prone countries in the world and has very high standards of construction. Very few people had been killed in the last earthquake, precisely because construction does withstand earthquakes. Tailings dams have to be scrutinised by government agencies and independent engineers to ensure that they can withstand any earthquake in Chile. He did not address the point that the dam is supposedly built to withstand an earthquake of 7.5 while the strongest recorded earthquake around the tectonic plate on which Chile is situated was 9.2. Ali Sargent (who has visited Caimanes to research the mine’s impacts) noted that the Chairman had talked of a ‘small group of protesters’ who had blocked the road to the tailings dam for ‘ten days’. She said that, if the Chairman cared to check media reports from multiple sources, he would see that they spoke of sustained protests between November and January, which had blocked access to the tailings dam. She said that the Chairman had spoken of good communication with the community, but these protests suggested that communication was not good. The blockade had involved an average of 150 people daily, with up to 400 people there at times. It was not the action of a minority, as the company contended. Given the level of dissatisfaction with the company, and the strength of these protests, how stable are shareholders’ investments? Ali said that over twenty communities in the Choapa valley had occupied the highway to demand that the company stop taking water from the river. She said that there is still water in the valley, but it is all behind the tailings dam. In the context of the prolonged drought, all of these communities are identifying Minera Los Pelambres as the problem. There is sustained protest against the company, suggesting that it is not a stable investment. Chairman Luksic said he and Ali were clearly reading different publications. He stood by what he had said about the protests. Ali said that she stood by what she had said – that there had been a very long protest. “By very few people,” retorted Luksic. This last remark reminded me of a similar comment in 2002 by Condoleezza Rice, former US Secretary of State, about the anti-war protest by two million people in Britain – possibly the largest political protest the country has ever seen. She said that, given that the total UK population was around 60 million, this was a small protest. Two shareholders both expressed concern that the announcement that morning that Rio Tinto’s problems at its Oyu Tolgoi copper project in Mongolia may be over may mean that the copper market may be over supplied and copper prices fall further. Luksic replied that commodities prices have fallen drastically in recent years but copper had fallen less than iron ore. There were no major new copper mines coming on stream and most analysts believe that the copper price will go back up again in the next two years, particularly if demand continues to increase at 3% a year or more. After the meeting, representatives of Minera Los Pelambres spoke to Ali and me, saying how important it is that the communities should ‘dialogue’ with them. I should have thought the communities have made it crystal clear what they want. The company needs to start listening, and accepting the community’s demands.